Conversing in their kitchen while making omelets, a couple in Redlands, California agree their current church is an unsuitable place to worship God. Some people go to church to express their style in designer clothes, fancy cars, and pockets full of the latest electronic gadgets. The couple has style but not in the typical consumer sense. They decide to approach the pastor about the matter. The pastor did not want anything to do with these omelet Christians. He remembers the story about his great-grandfather, Pastor Harold, who caved in to the automobile Christians who wanted to come to church with their cars. Soon the automobile Christians outnumbered the horse, foot, and trolley Christians. In fact, as space issues arose, the automobile Christians voted to stop converting the heathens, building larger parking lots instead of a larger church. To the atheist, this might seem like an odd, nonsensical start to an omelet review. However, one of the key components to Christ worship is the place of worship. A person who worships Christ without a proper place to kneel is like a duck without water. It was this integral part of worship that led the couple to the Mission Inn in Riverside, California. The story of the Mission Inn Hotel and Spa begins in 1876. The Inn was primarily a hotel and spa until 1910 when the St. Cecilia Chapel and catacombs were built. Today the Mission Inn consists of a swanky chapel and four restaurants that combine the freshest and finest ingredients to make anyone’s dinning experience memorable. The Mission Inn boasts visits by eight U.S. presidents. Of these, William Howard Taft was by far the largest. When Amy and I sat in his chair, we felt like little babies sitting in the backseat of a suburban. The only spatial relationship I have to Taft is Taft Street in Boise, Idaho. His street isn’t any larger then the two-lane Jefferson or Adams. To be true to its name, Taft Street really needs to be a six-lane street with a wide turning lane in the middle. My personal view of the Mission Inn Hotel and Spa: The restaurant offers a fantastic omelet experience! I would like to first mention that I worked at an establishment whose chef threw daily temper tantrums behind the swinging kitchen door. I’m now a fan of the open kitchen. As you can see from the photo, the Inn takes the open kitchen to a fun level. 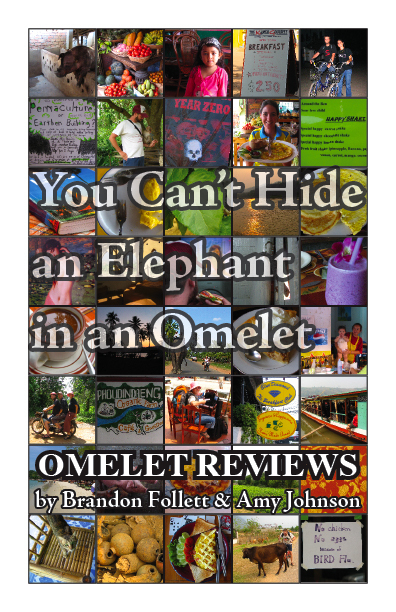 A guest walks up to the chef, decides what she’d like on her omelet, and watches the chef go to work. Not only does the guest have the pleasure of seeing the fresh omelet ingredients but also gets to watch skillfully quick hands and enjoy the chef’s witty banter. While eating the omelet, roaming musicians will stop and grace your omelet eating with beautiful music. The Mission Inn Hotel and Spa gets four stars based on a delicious omelet, live music, and polite chefs.